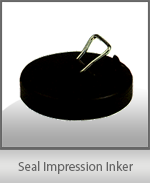 The seal impression inker is a MUST-have for notaries who use an embosser in states that require a photographically reproducible seal impression. Lightly rub over the raised seal image to darken it. Great for darkening your embossed seal image when faxing or photocopying notarized documents. Also handy for adding the signer’s fingerprint to your record book entry! Choose Your Quantity, Then Click Add To Cart.